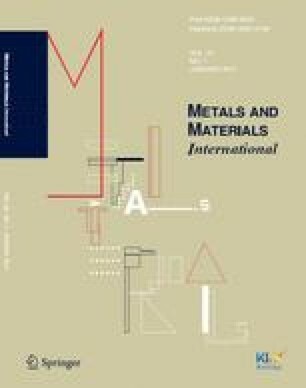 Carbon steels were hot-dip aluminized in Al or Al-1at%Si baths, and corroded in Ar/1%SO2 gas at 700-800 °C for up to 50 h. The aluminized layers consisted of not only an outer Al(Fe) topcoat that had interdispersed needle-like Al3Fe particles but also an inner Al-Fe alloy layer that consisted of an outer Al3Fe layer and an inner Al5Fe2 layer. The Si addition in the bath made the Al(Fe) topcoat thin and nonuniform, smoothened the tongue-like interface between the Al-Fe alloy layer and the substrate, and increased the microhardness of the aluminized layer. The aluminized steels exhibited good corrosion resistance by forming thin α-Al2O3 scales, along with a minor amount of iron oxides on the surface. The interdiffusion that occurred during heating made the aluminized layer thick and diffuse, resulting in the formation of Al5Fe2, AlFe and AlFe3 layers. It also smoothened the tongue-like interface, and decreased the microhardness of the aluminized layer. The non-aluminized steel formed thick, nonadherent, nonprotective (Fe3O4, FeS)-mixed scales.